Omega Centauri is the largest globular star cluster in angular size in the sky. It is an amazing view in small amateur telescopes. It is almost 16,000 light years distant, has a diameter of about 150 light years and contains about 10 million stars. Its angular size is larger than that of our full Moon. 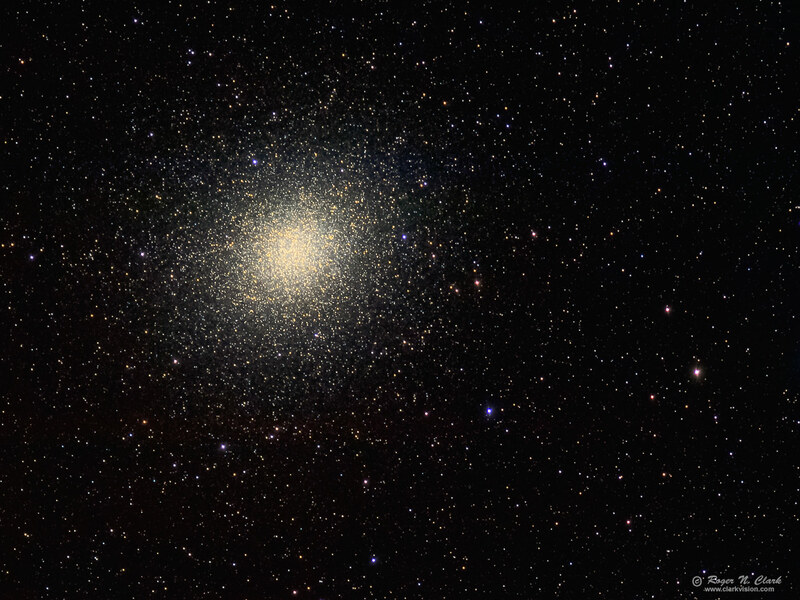 Omega Centauri may be the core of a small galaxy disrupted and captured by the Milky Way. The ages of stars covers a larger range than is typical for globular clusters, more consistent with a galaxy than a star cluster. Technical. This image was obtained with a stock Canon 7D Mark II 20-megapixel digital camera and 300 mm f/2.8 L IS II lens plus a 1.4x teleconverter giving 420 mm at f/4, and ISO 3200. No dark frame subtraction, no flat fields. Tracking with an Astrotrac and no guiding. Fifteen and one-half minutes total exposure (31 30-second exposures). This image is a crop to show detail at 2/3 full resolution, 3.0 arc-seconds/pixel in this image. This image was obtained with My Very Portable Astrophotography, Landscape and Wildlife Photography Setup. This image was obtained from the 9200 foot level on Mauna Kea Hawaii. At this latitude, 19.75 degrees north, Omega Centauri is low in the sky. But it was low in the sky in the direction of the erupting Kilauea volcano which was covering the island with considerable haze. To add to the difficulty, it was breezy, causing shake to the system, so I elected on the higher than usual ISO and shorter exposure times. CEFA = 5600 minutes-cm2-arc-seconds2 (2.0 arc-seconds / pixel).